Services like F&B, accommodations, taxis etc. are being regarded a locally rendered service, where the supplier is located. Everyone, entrepreneur or not, valid VAT registration number or not, customer located within the EU or outside of the EU, all must be charged local VAT. This also applies for the AMP, which is being held in Norway (and so the service rendered is considered to take place in Norway). ICCA is then compelled to charge 25.0% Norwegian VAT. In most cases, this paid VAT can be claimed back. For more information, please check with your tax office or accounting department. Non-member organisations considering ICCA membership, may request to attend as an Observer (once only), in order to find out more about ICCA and its business opportunities, meet the ICCA members and make an informed decision whether ICCA membership would be beneficial. Observer status is by invitation only and there is a special registration fee. For more information on attending as an Observer, please contact Pat Soen, Director Membership. Registered accompanying guests can attend all social functions. The fee for accompanying guest is €150. 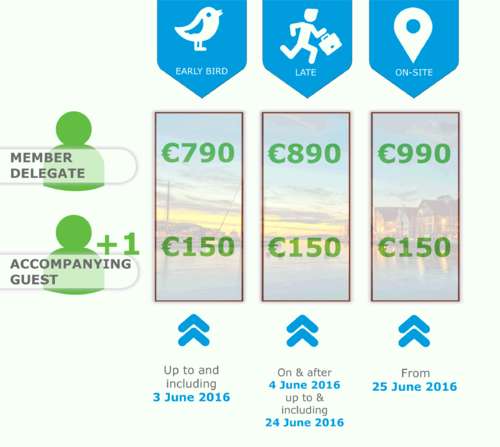 For cancellations received up to and including 5 June 2016, a cancellation fee of 100 Eur will be charged. Accompanying guests will be charged 50 Eur. For cancellations received on and after 6 June 2016, no refund will be given, full amount required.